Okay ladies and gents - its finally summer time! 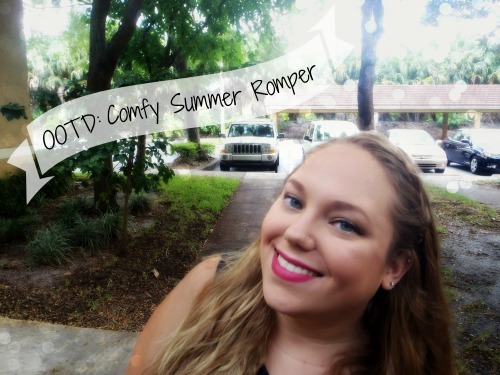 So you know what that means - rompers and shorts and super fun OOTDs! I'm excited to show you my first (I have a collection of like 5) rompers for the summer. Rompers are super cute, easy to wear and style, and cool (literally) outfits to gear up for summer in. I particularly like rompers because it makes a statement without really having to think about it. + this one is a pair of shorts, perfect for this hot Florida weather. 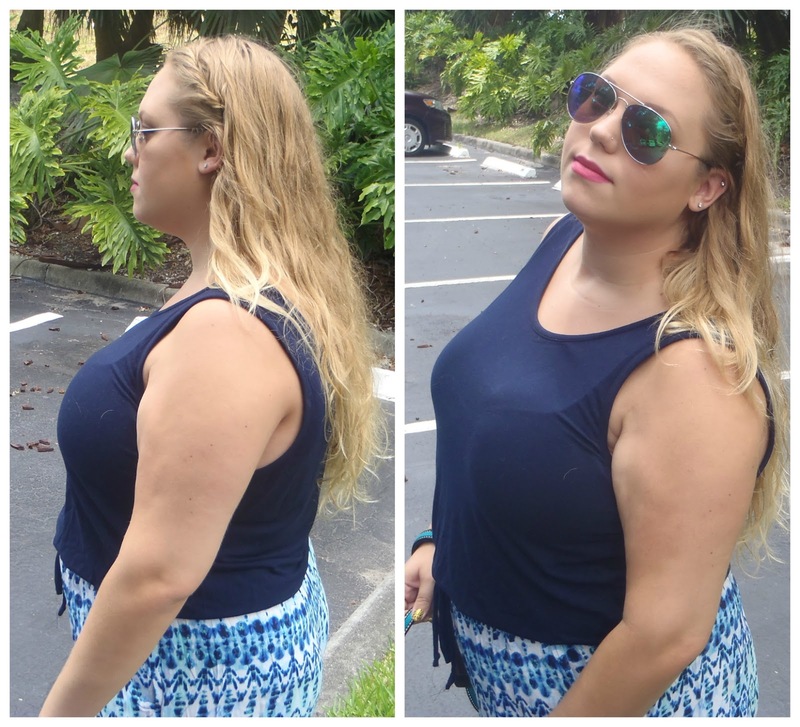 The romper itself is from Bealls, and it's got these cute blue and white patterned shorts and a solid blue tank with a drawstring elastic waistband in the middle. I kept my hair super simple and just twisted the front parts away from my face and let my hair hang naturally. I didn't apply any product, and it's actually just freshly washed in these photos. 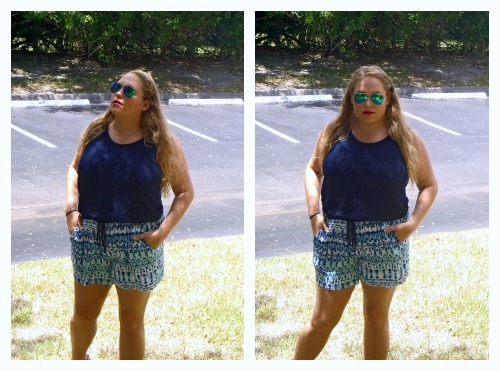 I paired the romper with silver gladiator sandals and some reflective aviator sunglasses from Walmart. 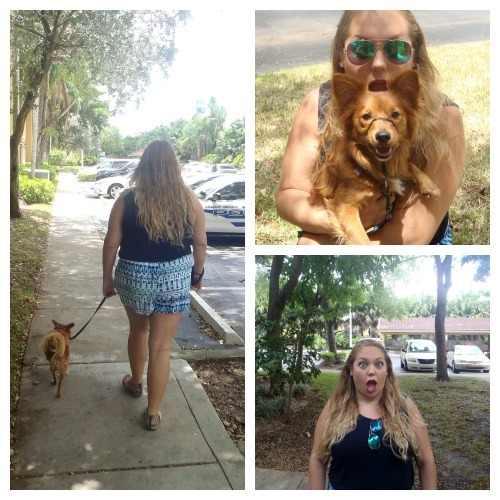 Considering it was about time to take Buster for a walk, he joined us for this photo session! I swear I think this dog is more photogenic than anything like ever. I'm sure it must get warm sometimes?! The shorts are the part that really drew me to this outfit. And if they were separates I probably would pair them with a navy tank anyway - so the fact that it came together as an outfit was just convenient! I love comfy clothing. Your outfit is really lovely, you look great! Thank you! Rompers are one of those things that are super easy but are also super cute!